Top of the Tower is on the 26th Floor of Midtown East’s Beekman Tower Hotel. With breathtaking views of New York City, Top of the Tower is recognized as one of the top 10 places for a romantic date. Deity and I ordered omelets for breakfast, which is a great start to any morning. I completed my meal with a sparkling mimosa. This may have been the first time I ever had a mimosa made with freshly squeezed orange juice. I, honestly, have to say it was one of the best mimosas I ever had. My omelet was stuffed with sausage, cheddar and onion. It was perfection! 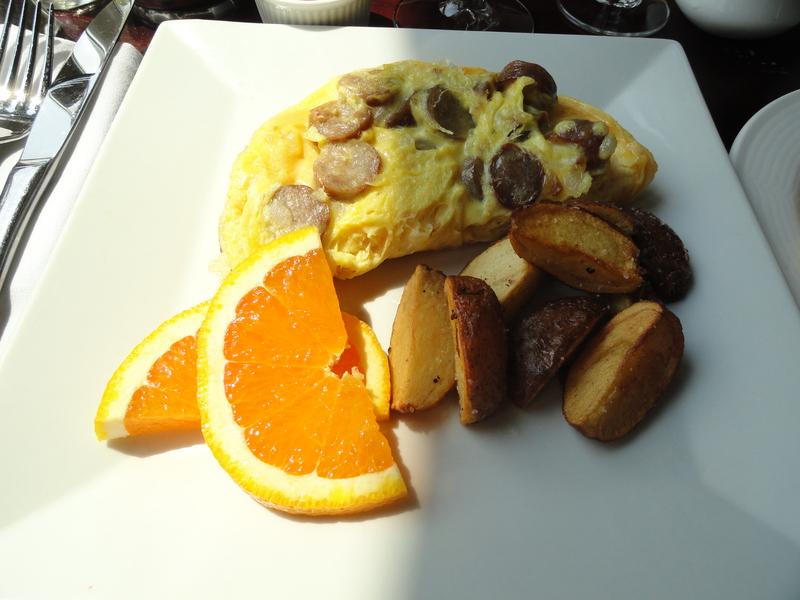 The sausage wasn’t a standard breakfast sausage served at most hotel restaurants. It had a taste of turmeric or some type of spice found in Indian curry; I’m not saying the sausage taste like Indian curry. I really enjoyed the sausage. Served on the side of the omelet are roasted potatoes – generously sprinkled with coarse salt and lightly dusted with cayenne pepper. The roasted potatoes is perfectly salted and had that extra, little, spicy-kick, which was a pleasant surprise.